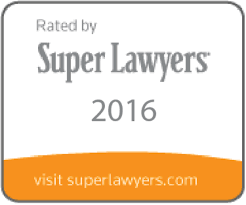 The Super Lawyers listed lawyers are found to be distinguished in their particular field and are nominated by their peers. The selection process is rigorous and multi-phased. Five percent of lawyers in the state are named to the Super Lawyers list and only two and a half percent are named to Rising Stars. In order to be eligible for Rising Stars, you must be no older than 40 or have been practicing law for no more than 10 years. About Super Lawyer: Recognizing lawyers from more than 70 practice areas on a state-by-state basis, Super Lawyers is a respected rating service in the legal community. They honor lawyers who have obtained the high esteem of their peers as well as professional achievement.